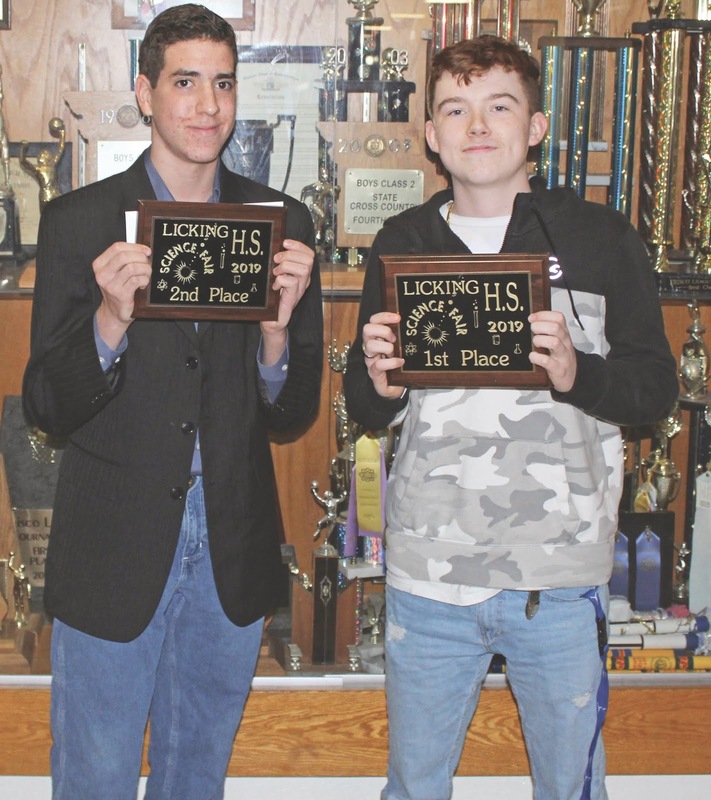 Overall winners for high school were Landon Medlock first place, on right, and Matthew Funk second place on left. Not pictured were Sydnie Werkmeister and Seth Farris who took third place. 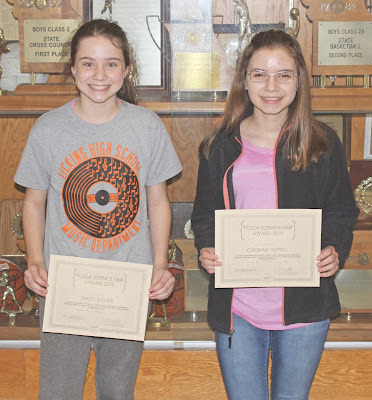 Seven categories were included in the Junior High Division (JH), including biology, physical science (part 1 & part 2), ballistics/arrow, sports science, food science, consumer science and human physiology/behavior. The High School Division (HS) included ten categories including: botany, microbiology, chemistry, physical science, human physiology/behavior (part 1 & part 2), consumer science, genetics (advanced), consumer science (advanced), chemistry (advanced), and human physiology/behavior (advanced). 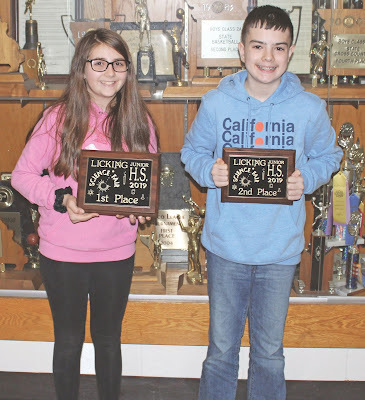 Overall winners for junior high were Gracie Berriault first place and Trevor Richards second place. Not pictured was Brodie Williams who won third place. 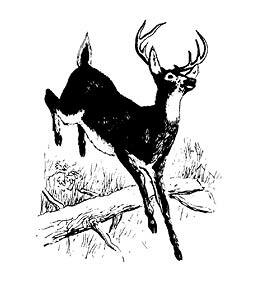 JH winners by division, for biology: Trevor Richards 1st, December Maxey 2nd; physical science part 1: Gracie Berriault 1st, Rusty Buckner 2nd, Silas Antle 3rd; physical science part 2: Calyn Huff 1st, Jordan Kinder 2nd, Summer Erbschloe 3rd; ballistics/arrow: Keyton Cook 1st; sports science: Austin Stephens 1st, Dawson Havens 2nd, Logan Gorman 3rd; food science: Brodie Williams 1st, Finley Sullins 2nd, Samuel Penn 3rd; consumer science: Zoe Mesger 1st, Kaitlyn Wade 2nd, Riley Moloney 3rd; and human physiology behavior: Ryleigh Barton 1st, McKinley Satterfield 2nd, Allie Decker 3rd. HS winners by division, for botany: Connor McLeod and Jordan Williams 1st, Nissa Buchanan and Rylie Smith 2nd, Kaiden Wantland 3rd; microbiology: Clifford Hawn and Landon Hock 1st, Liam Rainer 2nd, Allison Scott and Sidney Midkiff 3rd; chemistry: Kylie Taylor and Kasey Richards 1st, Autumn Grover 2nd, Kiley Ingram and Taylor Lucas 3rd; physical science: Spence Rogers and Evan Cady 1st, Trace Gale 2nd, Chance Campbell and Tristen Melton 3rd; human physiology/behavior (part 1): Auttumn Williams 1st, Kaleigh Fox 2nd, Jessie Hall 3rd; human physiology/behavior (part 2): Kevan Monds 1st, Seth Lay 2nd, Kaleb Lewis 3rd; consumer science: Cadrian Hutsell 1st, JB Huff and Casey Huff 2nd, Joe Neudeck and Eli Curran 3rd; genetics (advanced): Evelyn Tyree, Tyleigh Lucas, Camryn Clayton and Georgie Sanchez 1st; Abagail Moncrief, Hannah Tillery, Maggie Cline and Dawn Shepherd 2nd; Jayson Wallace, Tomi Rose and Lizzy Lewis 3rd; consumer science (advanced): Landon Medlock 1st, Kaleb Keaton and Easton Ice 2nd, Eli Keeney 3rd; chemistry (advanced): Sydnie Werkmeister and Seth Farris 1st, Matthew Funk 2nd, Anna Sullins and Wilson Murray 3rd; and human physiology/behavior (advanced): Aubrie Stephens and Annie Elledge 1st, Abagail Moncrief 2nd, Lainy Hadix and Anjeni Morrell 3rd. Finley Sullins, left, and Cadrian Hutsell, right, won the FCCLA Science Fair Awards for junior high and high school divisions respectively. Congratulations to all the winners, and to all the students who put their time and effort into forming a hypotheses and following the science to make a conclusion.